A stream draining a forested watershed at Hubbard Brook. Credit: Claire Nemes. 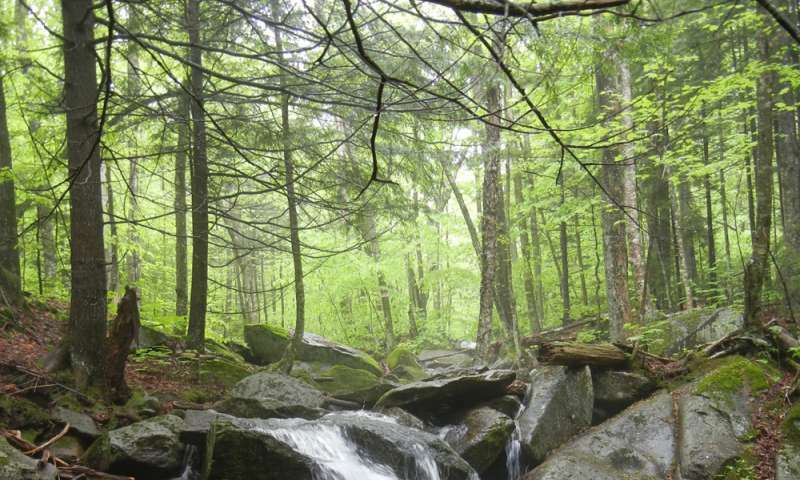 A legacy of acid rain has acidified forest soils throughout the northeastern US, lowering the growth rate of trees. In an attempt to mitigate this trend, in 1999 scientists added calcium to an experimental forest in New Hampshire. Tree growth recovered, but a decade later there was a major increase in the nitrogen content of stream water draining the site. So reports a new paper in the Proceedings of the National Academy of Sciences by a team of scientists from the Cary Institute of Ecosystem Studies, Duke University, and Syracuse University. Gene Likens, President Emeritus of the Cary Institute and co-author on the paper, participated in the calcium addition in 1999. 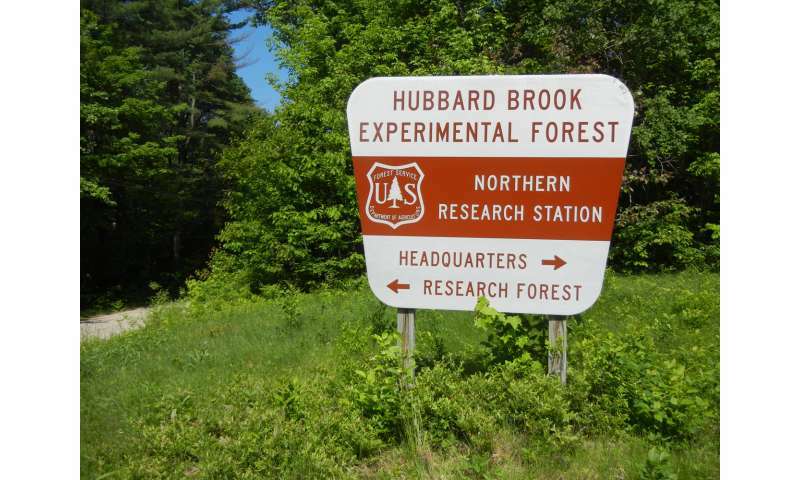 It took place at Hubbard Brook Experimental Forest, a 7,800-acre living laboratory in New Hampshire's White Mountains. Calcium concentrations in forest soils at the site had been depleted due to prolonged exposure to acid rain. The goal of the large-scale experiment was to test if restoring calcium to these soils would result in improved forest growth. Likens and colleagues added 2,600 pounds of Wollastonite pellets, a calcium silicate source, to a 30-acre forested watershed. And they waited. The soil pH and acid-neutralizing capacity of soils and stream water increased significantly, and forest growth rebounded. Sugar maples, a dominant canopy species with a high calcium requirement, began to recover. "For nearly ten years, it looked like our predictions were correct," Likens explains. "The calcium was largely retained and the forest was growing. Then, in 2010, we noticed streams draining the treated site had elevated nitrogen levels. By 2013, yearly inorganic nitrogen losses were thirty times what we expected, an increase we had only seen after forest clear-cutting experiments." Hubbard Brook Experimental Forest has been the site of extensive work on the impacts of acid rain. Credit: Claire Nemes. Growing forests typically act as nitrogen 'sinks,' with trees retaining nitrogen in their biomass. Yet a decade after the calcium addition, the treated site did the opposite, acting as a nitrogen 'source' and leaking high levels of inorganic nitrogen into nearby streams. This occurred at a time when atmospheric nitrogen pollution was declining and trees were not being cut down. Emma Rosi-Marshall, an aquatic ecologist at the Cary Institute and a co-author on the paper, explains, "Long term monitoring has shown that streams throughout the Hubbard Brook Valley have declining levels of inorganic nitrogen. The rules of conventional ecology suggested that after the calcium addition, forest growth would lead to even more nitrogen retention. Yet the treated watershed is shedding nitrogen." The study's authors suspect that when the calcium addition lowered the acidity of forest soils, it enhanced microbial processing of soil organic matter - releasing nitrogen stored in the forest floor. Other researchers at Hubbard Brook have been studying the forest floor and have found that soils in the treated watershed have decreased amounts of organic matter. The exact mechanism leading to nitrate losses remains under investigation. Co-author Emily Bernhardt, a biogeochemist at Duke University notes, "Results pose interesting questions about whether acid deposition has enhanced the way that the forest floor component of soils store carbon and sequester nutrients, and, if so, how this will change in response to the recovery of historic acidic conditions throughout the northeastern US." Findings illustrate the importance of sustained research and the complexity of mitigating acid rain. Likens concludes, "Long-term, comprehensive research is essential to advancing scientific understanding. Major, unanticipated impacts of an acid rain mitigation experiment took a decade to emerge. Our ability to track this study over time has shed new insight into watershed dynamics. In the end, preventing environmental degradation is easier than fixing the damages done."